We make a 45-minute drive to Yorktown. Yorktown was a bustling 18th Century seaport (mostly tobacco) where Lord Cornwallis and his British troops surrendered to General George Washington (who led American and French forces), which ended the Revolutionary War. From the visitor center (called the "Victory Center"), we walk a very pleasant, scenic path along the York River to get to the Yorktown Village. BTW, we have already learned that everywhere one looks in Virginia, there is a historic marker noting some sort of astonishing history that occurred "at this site" a number of centuries ago. Yorktown, of course, is full of such markers -- mostly in front of the original buildings that stood in the village over 300 years ago (town established in 1691). Having been to Williamsburg a few times in the past, where I enjoyed the compact, quaint, charming walkability of that town, I am a bit disappointed to find that Yorktown was apparently a quite sparsely settled location. It seems like more of a rural hamlet. 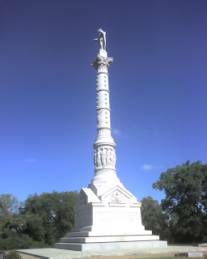 The "Yorktown Victory Monument", commissioned in the town in 1781 and built in the early 1880s, is -- excuse the expression -- "monumental" in stature. See photo. We depart Yorktown for the next piece of the triangle -- Williamsburg. Impressively, the "triangle towns" are all linked by the "Colonial Parkway", a road built by the National Park Service. Impressive because the road was designed to give you a "real" Colonial Virginia experience. Along its roughly 30 miles, there is not a single tourist sign or shop. No lights. No power lines. No office or retail buildings (or ANY buildings, for that matter). No billboards. Not even painted lines on the road. Just stately trees forming an incredible canopy that must be spectacular when the fall foliage changes the colors to yellow and red and brown. About the only signs you see are a handful of small white signs saying "No Passing" or speed limit 45 mph. Even the arching bridge underpasses are impressive, as they are brick rather than traditional gray highway concrete. The road surface is designed to somewhat resemble the shell and marl roads used in colonial times. It is still hard for me to believe this, but on our entire tour of the triangle on that day, we did not see a single ticky-tacky touristy shop or billboard or sign or blinking lights. No icon architecture. No cartoon plastic figures of Mickey or Porkey Pig embarrassing you. The feds have done a surprisingly incredible job of keeping the triangle free of commercialization -- particularly given the ENORMOUS number of tourists who visit each year. That alone is worth the visit. I've never seen anything like the Parkway. Unblemished by the trashiness that has so tarnished so many historic sites in America. Arriving at the Williamsburg visitor center, I am astounded to see the huge number of cars parked in the parking lot (we are later to learn, at lunch in the village, that this must be "parents weekend" for nearby William and Mary College – a college chartered in 1693 by the British). From the Center, you walk a bridge overpass that leads you through colonial-style pasture and farms. A short walk soon brings us back in time, where colonial Williamsburg appears to be frozen in amber. Admirable preservation of the original buildings, compactly arranged to create a charming walk that really brings you back to colonial days. 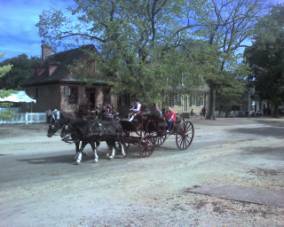 Williamsburg is so well preserved that it is known as a "living history museum." Lots of character actors walking around and driving stagecoaches in traditional clothing. Tastefully done, as many of them (including craftsmen such as the blacksmiths) are still engaged in a real trade. Not the corny stuff you expect at such places. Williamsburg still contains approximately 500 of its original buildings from the 18th Century, including the Governor's Palace (which picturesquely terminates a vista behind a green). Terminating another vista on Duke of Glouchester Street is the Capitol building of the time (in colonial days, Williamsburg was a center of power, culture and commerce). The town is so delightful that I am more than happy to walk it with my wife, even though I had just walked it a week prior. Don't miss Williamsburg. After a few hours of strolling and eating lunch in the town, we are back on the Parkway heading for Jamestown Settlement. Jamestowne is considered "America's Birthplace." Archeologists have unearthed the original 1607 James Fort along the James River. (The 400th birthday is being celebrated this year) Jamestown is the first permanent English colony in "the New World." We skip the tour of the settlement area, as it seems a bit hokey in the visitor center video, and even though it is a "Fee Free Day." 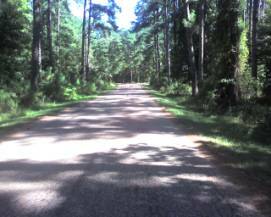 Instead, we bicycle from the center on the 5-mile Jamestown Island loop, which is a wonderful bicycling treat. A narrow roadway which is mostly one-way and sparsely traveled by cars, it is a great place to bicycle. A magnificent tree canopy much like the Parkway, the route takes you through marshes, creeks, and panoramic views of large water bodies (including the James River) on both sides of you. See photo. After getting back to the Center, we hop onto the recently completed Virginia Capital Trail (a 10-foot wide paved off-road trail). The first few miles are superb, as the trail runs through forests, pastoral soybean farm settings, and boardwalks over a large, apparently quite paddle-able marsh (much like the marshes on Jamestown Island). We turn around after this, though, as it then mostly follows the roadway in a relatively unrewarding way.